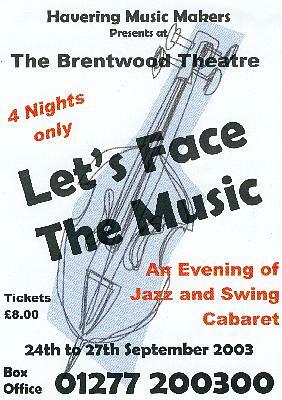 Our first ever visit to the Brentwood Theatre was a great success for us. We nearly sold out all our performances, which is a fantastic achievement considering we were outside our local area. The appreciative audience were treated to a wide variety of songs including Darktown Strutter's Ball , Something Stupid, Blue Moon, Mack the Knife and Minnie the Moocher. To see the full song list click here. A particularly fantastic reception on the Saturday night included cries of "Encore, encore"!! HMM would like to thank the Brentwood Theatre for their great hospitality, especially Mark Reed and David Zelly for their assistance.